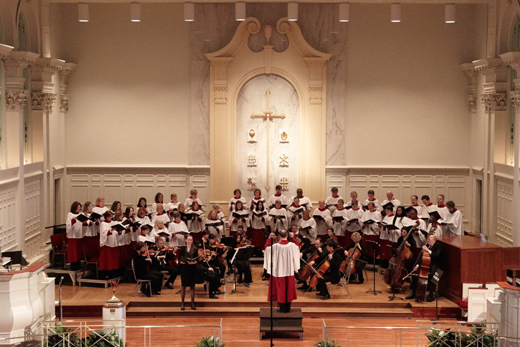 "Cries for Mercy: Kyries of Bach, Mozart, and Beethoven" is the title of this year's Glenn Chancel Choir spring concert to be Sunday, March 30, at 7 p.m. in the sanctuary of Glenn Memorial United Methodist Church. Steven Darsey, music director of the Glenn Memorial United Methodist Church, will conduct. The concert will include the complete Mass in C by Beethoven with professional orchestra and commentary by theologian Albert Blackwell. Following the concert whose selections demonstrate the power of music for theological communication, Blackwell will give a brief exploration of contrasting musical-theological characteristics of Bach, Mozart and Beethoven, followed by a brief period of discussion. Blackwell is Reuben B. Pitts Professor Emeritus of Religion at Furman University. Orchestral accompaniment will include Emory's Vega String Quartet and members of the Atlanta Symphony Orchestra. Timothy Albrecht, Emory University organist, will accompany the Mozart and play continuo for the other works. Soloists for the Beethoven will be Alexis Lundy, Cynthia Shepherd, Timothy Miller, and Stephen Ozcomert. The two-hour concert is free — an offering will be taken. For more information, visiti Glenn Memorial United Methodist Church. Contact: Nancy Buckhannan or call 404-272-2051.